In a heartbeat, the medical miracle that gave Ryan a second chance at life is about to become a curse worse than death. For Ryan is being stalked by a mysterious woman who feels entitled to everything he has. She’s the spitting image of the twenty-six-year-old donor of the heart beating steadily in Ryan’s chest. And she's come to take it back. Ryan Perry has it made. He's a young, good-looking guy in his early 30s with everything he could ever want including a beautiful girlfriend. He struck it rich as the CEO of a social networking site, and now he's living the dream. While out surfing one day, he gets chest pain and his heart races and attributes it to an anxiety attack. When it happens again, he takes it seriously and contacts his doctor who arranges for tests. He is stunned when he is told that he needs a heart transplant. After a few months, a donor is found and Ryan undergoes surgery. Everything goes well, and then the timeline moves ahead one year. Someone is gaining access to his home, bypassing his security, and leaving trinkets and gifts for him with an ominous message. Ryan believes that his new stalker is somehow tied to the donor heart that he received. 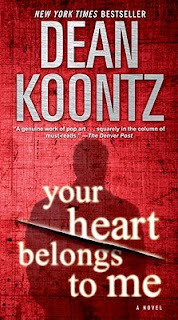 When Koontz describes Ryan's heart episodes, he is so descriptive and convincing that it gave my heart sympathy pains! I wonder if Koontz has first-hand experience with this, or whether it's just good research. I really was so caught up in this story, the first half of which was like a medical mystery and the second half was like a creepy stalker thriller. This was a fast read for me, and I really enjoyed it! I'm a big Koontz fan, generally preferring his older work, so I was pleasantly surprised at how much I enjoyed this newer (to me) novel. 4 stars!! It was really good, and you should put it on your TBR if you enjoy horror or thrillers.